What are the most important sutras? We are sometimes asked what are the most important sutras of our tradition? I often answer, which ones are not important? Everything teaches us. Our roots come from Chinese Buddhism and our Chan tradition embraces all the sutras of the Mahayana, all the 84,000 practices of the Awakening Shakyamuni. All are the doors of the Dharma. 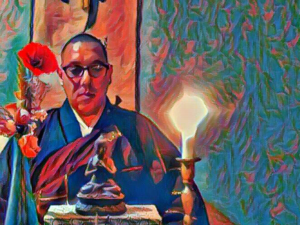 However, our Chan / Zen tradition, besides the essential Sutras, the Lotus Sutra, the Amitabhas Sutras, Nirvana, Avatamsaka and the wonderful Shurangama, we study what I like to call the Three Sutras of the Heart. What are these three Sutras so often united in Chinese Buddhism? These are of course the triptic so dear to all our practitioners: the Sutra of the Heart, the Sutra of the Diamond and the Sutra of the Platform of the Sixth Patriarch. Our Order is very proud to celebrate the anniversary of the ordination of the Sixth Patriarch, the book of the founders of our Order (Master WeiMiao JyDin Shakya and MingZhen Shakya) which can be found here: Empty Cloud: The Teachings of Master XuYun which was published in a special edition with the “Three Sutras.” It is a reference book for all our practitioners. It was an honor that we had made the successor of the very Venerable WeiYin, abbot of NanHua Si at the time, and our first Chan master of Ming Zhen Shakya. May the “Three Sutras” be three wonderful mirrors of our practice.